On the 25th May 2018 , the data protection directive will be replaced when the General Data Protection Regulation (GDPR) comes in to force. This means that all organisations who deal with data need to review their procedures and processes and understand the changes and how if will affect them. Schools, by their nature deal with a lot of personal data and therefore it is important that they understand what will be expected of them through the introduction of GDPR. 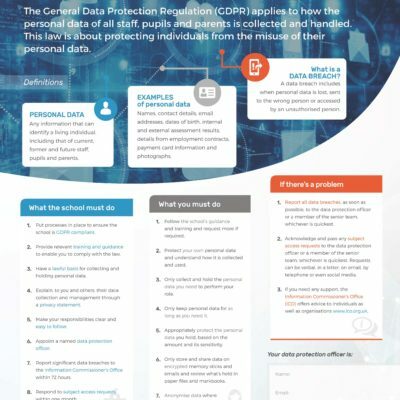 Here are details of some resources and services to help schools understand GDPR and the actions they need to take to ensure they comply. 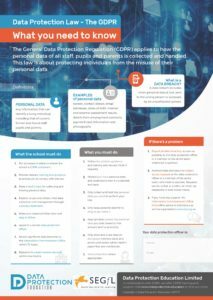 SEGfL GDPR poster – guidance on GDPR for schools that can be printed to post around the school or staff room. This can be downloaded from the link below.